Arguably Africa’s most famous attraction, the 1.7km-wide Victoria Falls lives up to its hype, especially when viewed in full flow. At its peak between February and May, more than 550 million litres of water (enough to fill 220 Olympic-size swimming pools) spills into the Batoka Gorge every minute. The falls can be viewed from both Zambia and Zimbabwe, but Zambia tends to be quieter and more intimate. From August to December the flow may not reach the Zambian side at all, but daytrips into Zimbabwe can be easily arranged. p>Mosi-oa-Tunya National Park is well geared for travellers, with an intimate network of pathways and viewpoints, a restaurant and numerous information boards. 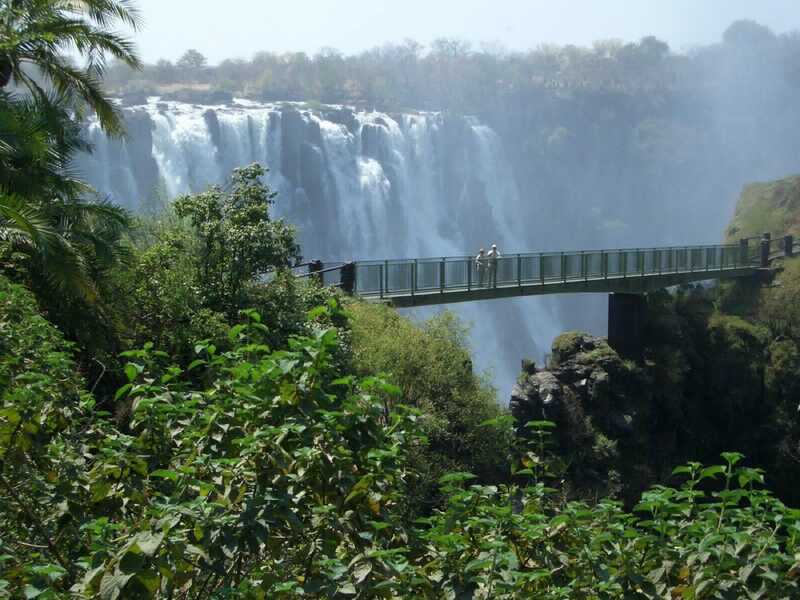 The Zambian side also boasts what is probably the falls’ most dramatic viewpoint – the Knife Edge Bridge, which is completely shrouded in mist during peak flow. Above the falls, Livingstone Island and the Devil’s Pool are only accessible from the Zambian side, the latter a spectacular swimming spot right on the edge of the falls. It’s a major highlight, but for the brave only, and only open between August and January. If adventure activities are your thing, there’s also sky-diving, bungee jumping, abseiling and white-water rafting. The rafting is also best between August and January, when the river is lower and the more difficult rapids are safe to run. It’s difficult to recommend a best time to visit Victoria Falls. Swimming in the Devil’s Pool is only possible when the water level is low (from August to early January), and white-water rafting is also best during this period. On the other hand, peak flow is incredible to see. It’s these months, from February to May, that give the falls its local name: Mosi-oa-Tunya, ‘The Smoke That Thunders’. If you’re visiting during peak flow, take a raincoat and waterproof shoes (or flip flops). You’ll certainly get soaked it you don’t. Plastic ponchos are also available to rent at the park’s entrance and an extra one of these will help to shield your camera. There’s no shortage of hotels, lodges and tented camps in the area. The upmarket lodges are generally along the upper stretch of the Zambezi River, above the falls, while more affordable backpackers and hotels can be found in Livingstone town itself.